I am not a lifelong ceramicist. In fact I came to being a visual artist late in life. I started out making mostly functional objects in stoneware. I was keen to make them as interesting, unusual and satisfying to hold or use. Each piece was unique and I spent much of my time thinking about and creating that uniqueness. I was strongly influenced by the Japanese concept of wabi-sabi, a set of aesthetic principles rooted in Zen Buddhism. These ideas stress simplicity, traditional materials and beauty arising from well executed functionality. I moved on from making functional objects to a more sculptural and decorative approach and am still making that kind of work. However I am still developing as an artist. I don’t have a specific ‘Style’ and maybe never will. I experiment. I love teaching and find that even an absolute beginning student can produce work that excites me and makes me want to explore the ideas that come up in a workshop session. I love wood-fired work. 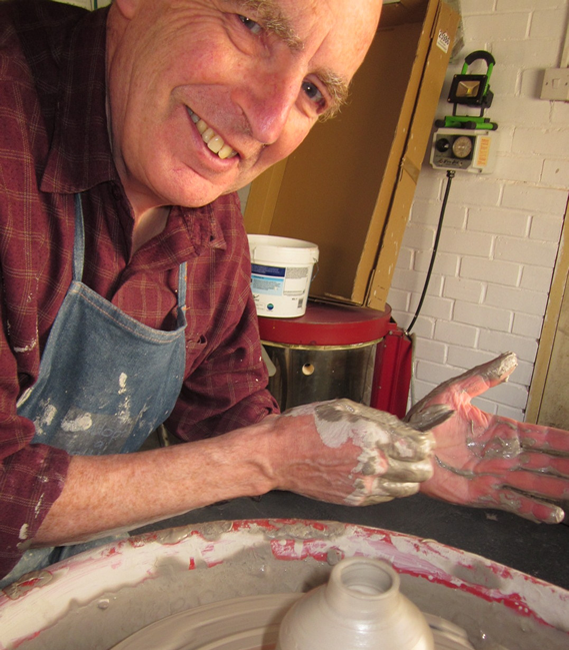 I can’t do it where I live, but have pushed pots into other people’s wood-fired kilns. I have dug my own clay for some projects. The primal, magical, mystical process of digging your own clay, fashioning it by hand and then making fire to transmute it into something new, rich and strange just holds me in awe. When people talk about nature they usually mean trees, plants and animals. Nature for me is fire and earth.